Crayola Crayon Factory is a must have this holiday season! My kids love coloring so they have buckets of old crayons laying around the house as I'm sure most kids do. That's why this Crayola Crayon Factory is the perfect gift for kids! Kids love coloring and they loving creating new things. 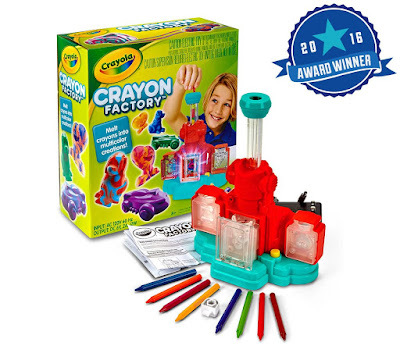 With Crayola Crayon Factory you can combine that love and create new crayons from your broken ones and they color and play with the new creations. As a mom I love that kids can reuse their old crayons to create fun new crayons in shapes of cars, puppies and more. My kids play with the fun new crayons they've created just like they're toys and then when they color with them they love seeing the new color they've created. Crayola Crayon Factory is super easy to use and my kids love sitting and watching the crayons melt into new shapes. Crayola Crayon Factory is a super fun toy for kids and I highly recommend it. Be sure to grab your Crayola Crayon Factory the next time you're at the store because I predict it's likely to be a very hot item this holiday season!